To many Brazilians football is a religion, so much so that international match days are celebrated as bank holidays. So as you can imagine when Brazilians heard the news that the Football World Cup would be held in their country they were over the moon. Football was coming home. Yet during this year’s Confederations Cup we have witnessed the largest demonstrations in a generation across the country’s major cities, marching against the Cup with banners and placards proclaiming “Cup for who?”. Focusing on Belo Horizonte (BH), one of the host cities for the game, why did the protests start and how have they developed? The demonstrations began in Sao Paulo and were initially sparked by rises in public bus fares, and called for free bus passes for students - a long running campaign. Similar demonstrations followed in other cities, including BH where, on June 15, 8,000 marched against a R$0.20 (7p) fare rise. That may not sound like much, but in a country with a growing driving population, it is the working classes and favela residents, those who can ill-afford fare increases, who predominately use public transport in Brazil. If you live in one of the favelas in the outskirts of the city you may need up to three buses to get to work and three back – a rise of 40p a day. To add insult to injury the city government launched a free tourist bus for tourists to see the city weeks before the Confederations Cup, which included a soft drink, snack and alcoholic beverage. In response to the protests, only a few days ago the city-government repealed the fare rise by a meagre R$0.05, whilst at the same time dropping the bus companies’ tax by R$0.10. The second wave of demonstrations focused on the World Cup. The two major international sporting events, the Olympics and the World Cup, held every four years are notorious for succeeding a variety of human rights abuses by the host city-governments in the rush to comply with International Olympic Committee or FIFA regulations. Just as we saw in the last World Cup in South Africa, at the Beijing Olympics or the Commonwealth Games in New Delhi, history is repeating itself once more as Brazil prepares for the games at the cost of its people’s rights to housing, life, work and protest. As we have seen elsewhere the governments of the host cities often use the mega-event competitions as excuses to displace and vilify undesirable populations from valuable land in city centres, near the stadiums or around central routes to make way for new premium developments for wealthier citizens or tourists. Across Brazil 170,000 people have been or will be forced out of their home in preparation for the games. The displacements are carried out without compensation or satisfactory resettlements, often undertaken with physical and/or psychological violence. ‘Cleansing’ the streets of homeless people is a common practice by host cities before the games. The National Centre for the Defence of Human Rights of the Homeless and of Collectors of Recyclable Materials stated that in BH the homeless are increasingly victim to increasing police violence. The number of murders of homeless people has reached 100 in the last 2 years. 35% of these deaths have been by gunshot leading to suspicions of police brutality. Furthermore, the “FIFA by-laws” demand a 2km radius around the stadium where informal economic activities cannot take place; informal activities which are a key resource for many working people. As a result o the by-law 150 families have lost their right to work around the stadium, a job which some have had all of their life. 750 street vendors have been made destitute from their place of work and 5,500 workers have been directly or indirectly affected. So far there has been no compensation from the government. The purposes of the bye-law are plain to see, it is to ensure a monopoly of profits for the international sponsors of the mega-events. The right to protest has also been criminalized within the 2km area. In BH this area includes the Federal University of Minas Gerais (UFMG). In the state of Minas Gerais, of which BH is the capital, the Justice Tribunal of Minas Gerais banned demonstrations on match days. The organisers of a protest faced a R$500,000 (£167,000) fine. After 20,000 people defied this law in BH on the 17th June the law was eventually overturned a few days later. However, demonstrations within the 2km area are still banned. Hence why more than 65,000 people in BH marched on the match days of the 22nd and 26th June and attempted to cross the police barriers protecting the 2km radius. Many Brazilians had expectations that the Cup would bring investment in public services that would benefit everyone. Two areas in dire need of investment are healthcare and education. Some blame this on the widespread corruption of politicians. 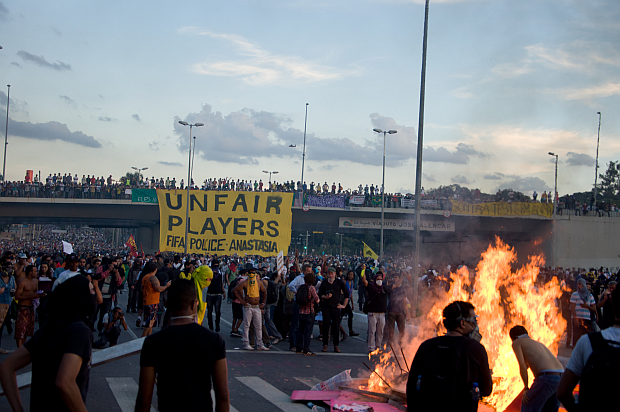 The protestors demanded to know why they have to pay more for public transport, whilst R$28 billion (£23 billion) of public money had already been spent in the private sector for the Cup. Why is it that they have to wait days in public emergency rooms, whilst R$8.4 billion (£2.8 billion) has been spent on airports? Why is it that the state education system is poorly funded, state school teachers are poorly paid, whilst almost R$700 (£233 million) has been spent on refurbishing the Minerão stadium in BH? Not only has this money been spent on the Cup instead of public services but the state of Minas Gerais has guaranteed FIFA and the Minerão stadium a profit – in other words if the private company do not make a profit from the games, the state will cover their losses. Essentially, rather than investment in public services to the benefits of standards of living, Brazilians have seen their basic rights to everyday life infringed for the benefit of private interests. Although the protests began on those topics they soon spread to other points of dissatisfaction, such as the need for real participatory democracy. For example ‘Cura Gay’ - a bill that is to be voted on which would allow psychologists to treat homosexuality as an illness to be cured, a woman’s right to choose, legalise cannabis … and countless other individual placards. That is the nature of the demonstrators as they have no leaders, parties or organisations managing them. So much so that groups with large banners battle for the front of the marches, at times racing ahead of one another, leaving the rest of the march behind. The trajectory of the demonstrations is decided organically by the people marching. As the marches roam the city streets, shop keepers shut for the day, which allows the workers to join the protests. The demonstrations are made up of all sections of society: students, workers, families, kids from favelas, executives… Due to its widespread support people chant “The people woke up”. The mainstream media jumped on the bandwagon of support for the protests. The right wing press were especially supportive, and focused their coverage on the corruption of politicians in an attempt to delegitimize their natural enemies, the centre-left government. Throughout the demonstrations they praised those holding Brazilian flags and singing the national anthem, which lead to an increase in the visibility of nationalist right-wing groups in the protests. In parts of the country these groups attacked other protesters using left-wing party flags or t-shirts. Along with General Azevedo’s manifesto on the demonstrations that warned of the readiness of the military to act if order is not regained (a claim somewhat reminiscent of current events in Cairo), the fear of another military coup has had a severe grip on the movement. As is common in many ‘democratic’ countries with right-leaning or institutionalised media outlets, the mainstream media has by and large distorted the truth about the confrontations with the police and criminal damage carried out by protestors. ‘Infiltrated minority’ is a common term used for the thousands of people willing to defend themselves from police violence and to symbolically damage the property or advertising of those companies in benefit of the great games give-away; multi-national companies, banks, Cup-related advertising and government property. While eager to pick up on rare acts of property damage, the mainstream media rarely discuss the real infiltrated minority: the undercover police in the marches (video), which protesters say are known to instigate violence toward the police in order to justify their actions against the protesters. When the demonstrators tried to walk through the police barriers - Gandhi-style - that protected, what the police commander for BH, Coronel Claudia called, “FIFA territory” they were met with tear gas, rubber bullets, batons, cavalry and pepper spray. This sparked outrage amongst the demonstrators, many of whom retaliated by tossing back the tear gas canisters, throwing stones at the police and destroying the shops of big business. During the first protests in BH groups of middle class pacifists and reformists would shout “without violence” during these acts. However by the last demonstrations, with increasing police violence, the slogan has been rarely heard. Instead people from all backgrounds have come ready with helmets, goggles, masks and shields to defend themselves and their rights; an unfortunate yet increasingly necessary attire for those across the world expressing their right to disagree. In 2012 the UN recommended that Brazil should cease to have a militarized police force, instead the Brazilian government have continued to invest as was most visibly seen in the favela clearances or “pacifications” in Rio. Many of those striking back at the police are young people from the favelas which have long experienced daily police repression at the hands of the police and suffer most from neoliberal development of their local areas. Conversely, it is not just the kids from the favelas in the front lines. You see people from different classes, backgrounds, political orientations, gender and age fed up with a system that favours private interest over public good. The demonstrations, thanks to the numbers attending and the magnitude of civil disobedience, have got the attention of the politicians. The President, Dilma Rousseff, gave a speech where she acknowledged the concerns of the people, offered some solutions she will undertake and promised to listen to the different groups involved in the demonstrations throughout the the momentum of the movement. In many cities we have also seen a symbolic decrease in the bus fare price. Yet this is not enough to curb the passion of the awakened people. Now that the Confederations Cup has ended the movement is looking to use other tactics. For instance, in Belo Horizonte on the 29th June an occupation of the Municipal Chamber began, which threatens to not budge until the Mayor meets their demands. Twice a week there are also People’s Horizontal Assemblies that anyone can participate in to decide the future of the movement. Furthermore, people are setting fire to buses and cars to block the main commercial routes in and out of the city, a tactic successfully used in El Alto to dispose of the Bolivian president in the 2000s. If the people’s wishes are not met this Confederations Cup will have just been a practice run for both sides before next year’s World Cup.